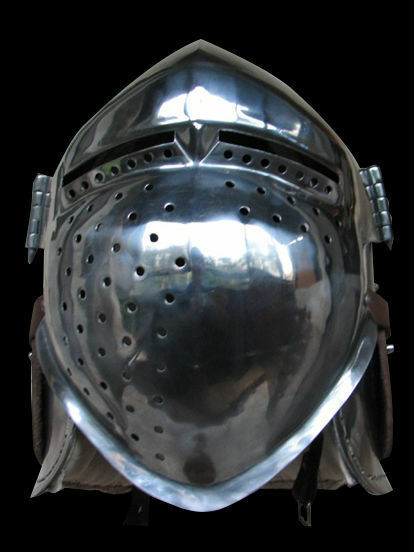 Bascinet is a type of medieval head protection, which replaced the Great Helms in the middle of the XIII century. 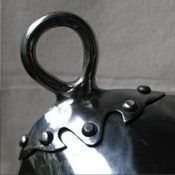 Such helms gained popularity very fast among knighthood due to its comfortable and functional design. This model with side hinged mobile visor was mostly popular in the XIV-XV centuries. Such type of visor attaching allows changing standard visor to bar grill very easily depending on your needs on battlefield. There two eye slits and numerous holes on the visor. So, you may breathe and see without any problems. 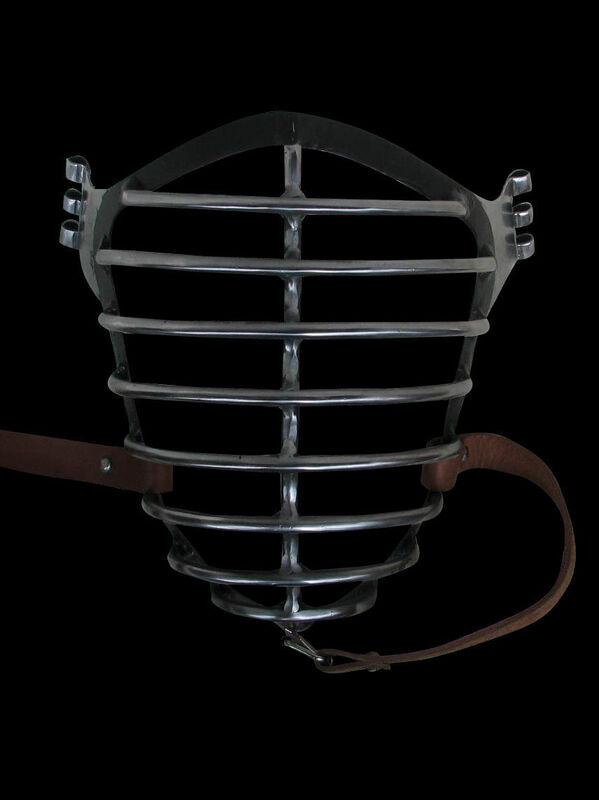 Helm bascinet is completely handcrafted by parameters of customer. You may also like these models of medieval bascinets: Bascinet Hounskull with single ocular of the 1430 year, Bascinet with side hinged bar visor, Bascinet with curved visor. Great Bascinet (fr. 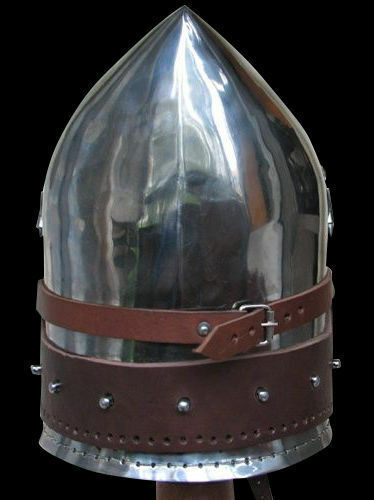 "Grand Bassinet") is a type of medieval battle helmet, which has appeared early-middle XV century. 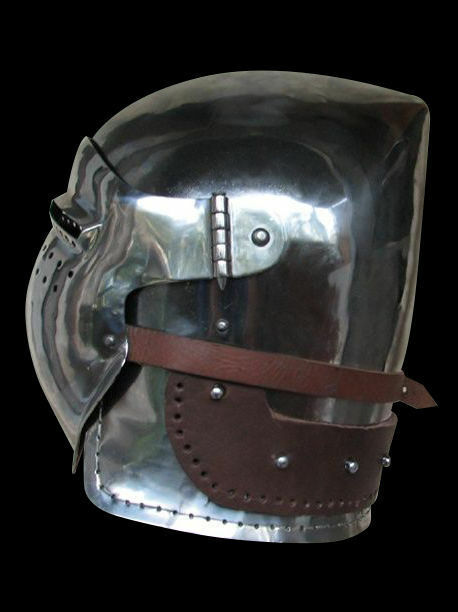 It evolved from Hounskull bascinet: visor became non-pointed, more roundish and close to the face. Bascinet got a wide metal gorget (bevor), which protected throat and front of the neck. Extended part of dome covered back of the neck. Movable visor with two oculars and holes on the right side provides with good visibility and ventilation. 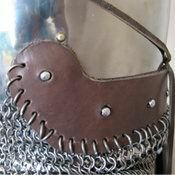 Visor is fixed to the gorget with steel hook. This medieval armor is completely handcrafted by personal parameters of customer. You can use this handmade head protection for: SCA HEMA Larp Stage performances Medieval festivals Reenactment events Main photo shows steel battle helmet with following options: Cold-rolled steel 1.5 mm; Satin polishing as finish treatment; Steel rivets; Brown leather and steel vervelles for aventail; Sewn liner Base price includes following options: Cold-rolled steel 1.5 mm; Satin polishing;.. Medieval helmet bascinet with "Wolf ribs" visor was known in the Western Europe in the end of XIV-early XV centuries. You may see soldiers wearing such type of helmet on the paintings of Master of the Trebon Altarpiece (1380 year) and Karlsruhe altar (1450 year). However, in comparison with other models of bascinets, helmet with “Wolf ribs” visor was quite rare model; no artefacts are survived.  Visor is movable (klappvisor system), it completely protects your face and provides with a good field of vision. 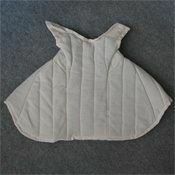 Sewn liner makes wearing of medieval bascinet very comfortable; the neck can be additionally protected with padded and mail aventail. 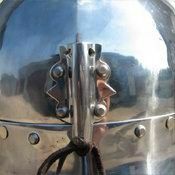 You can use this battle helmet for: SCA HEMA Larp Stage performances Medieval festivals Reenactment events Main photo shows functional helm with following options: Cold-rolled steel 1.5 mm; Satin polishing as finish treatment; Steel rivets; Steel nickel-plated buckles; Brown leather belts; Sewn liner Base price includes following options: Cold-ro..